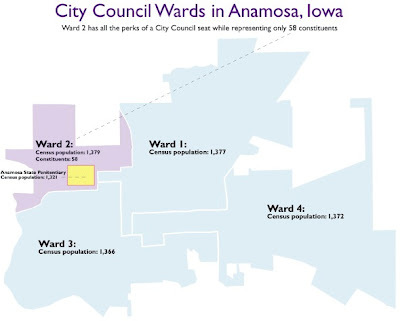 Called prison-based gerrymandering, the practice finds its clearest example in Anamosa, Iowa where a large prison constituents almost an entire city council district. Council districts are supposed to contain the same number of people, but basing districts on non-voting non-resident prison populations gives a handful of residents the same political power as thousands of residents elsewhere in the city. The Census Bureau counts people in prison as if they were residents of the communities where they are incarcerated, even though they remain legal residents of the places they lived prior to incarceration. As Census data is used to apportion political power at all levels of government, crediting thousands of disproportionately urban and minority men to other communities has staggering implications for modern American democracy. 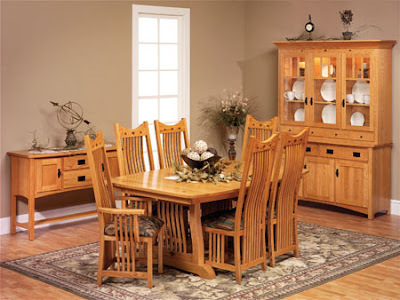 In New York State, for example, one out of every three people who moved to upstate New York in the 1990s actually “moved” into a newly constructed prison. The State bars people in prison from voting, but their presence in the Census boosts the population of the upstate districts whose legislators favor prison expansion. Without this phantom population, 7 upstate New York State Senate districts would not meet minimum population requirements and would have to be redrawn. Hard to believe that this type of horsepuckey is occurring in America TODAY. What an insult to the American people. I had no idea this was going on or how large of an affect it has. Simply another example where politicians prove that they will do anything to remain at the reigns of power, and yet another example of why some political reform is necessary in America today. Separating special interests' money from politicians is a great place to start, I hope everyone supports Freedom’s Vision, we’re still working hard on getting it organized – volunteers are needed.